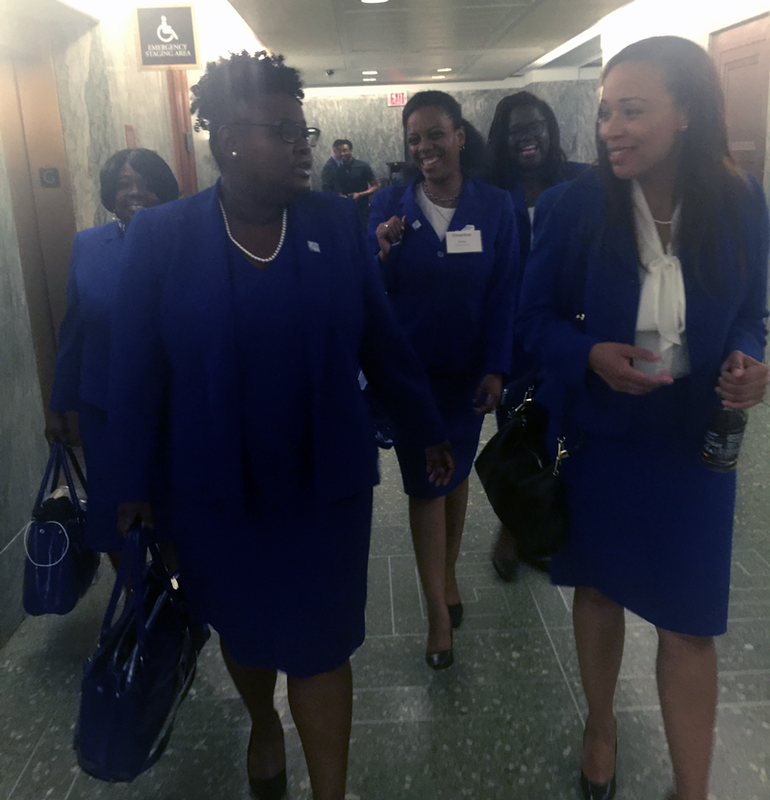 On Tuesday September 13th, finer women across the country stormed the US Capitol for Zeta Day on the Hill to advocate for issues of importance to women and our communities. And yes, we walked the halls of the Senate office buildings like we belonged there – because we absolutely do! And thank you Sorors for showing up in Finer fashion – you looked beautiful in your royal blue and white! I think many of us stopped counting how many times we were stopped and complimented on how wonderful we looked in our colors! Even Congresswoman Joyce Beatty (and member of Delta Sigma Theta) took notice – and sincerely thanked us for coming to the hill! Sorors from various states met with their Senators or staffers to discuss issues ranging from elder care to anti-bullying. Sorors from the state of Maryland met in the Dirksen Senate Building with Senator Ben Cardin’s senior staffer Mr. Matthew Spikes to discuss our concerns regarding police and community relations. I was very impressed with Mr. Spikes and could tell that he really did his homework before meeting with us. He was definitely prepared for us. Not only did he provide concrete examples on what Senator Cardin is doing to address racial profiling and police accountability, but he invited Zeta Phi Beta to take an active part in advisory groups to help the Senator address these issues. I don’t know about you, but I was re-energized by our visit to Capitol Hill yesterday. It was a great opportunity to network and fellowship with some amazing Sorors that I hadn’t seen in a while, but I was especially inspired by Soror Congresswoman Donna Edwards who spoke at our Capitol Hill forum “A Seat at the Table”. She encouraged us to ask the woman sitting next to us (on our left and right) to run for political office. While I can’t say that I’m going to run for office right this moment 😉 I can for the first time say that it’s something I’m considering. Even if you don’t run for office right now, there is still alot you can do to get involved. Our International President Mary B. Wright has provided the sisterhood with detailed Get Engaged directives. We can hold voter education events, conduct registration drives or even volunteer with our local board of elections as poll monitors or election judges. I had the opportunity to serve as an election judge in my county for the 2016 presidential election. And lastly, while it’s important to look finer – BEING finer is also about doing the work to improve our communities. Thank you Sorors for continuing to BE the finer women that you are. It was my pleasure being apart of Zeta history we stormed the Hill on September 13, 2016. Can’t wait until next years ground shaking event. Absolutely Soror Johnson! See you at ZDOTH 2017!